Thanks for a great challenge last week, your “Inchies” cards were fun and fabulous – and thanks for the inspiration! This week we challenge you to make Thanksgiving Any Hero Cards! Simply make a Thanksgiving themed card, write a message for one of our Heroes , enter your card in our Inlinkz widget and add it to your OWH box. I can’t wait to see your card creations! We don’t have a sample card maker for this challenge. My e mail has been getting lost in cyber space and I’m sorry to say I lost contact with my sample card maker. If you’d like your card to be posted where the sample card usually is just be the first person to post a Thanksgiving Any Hero card and I’ll take care of the rest! 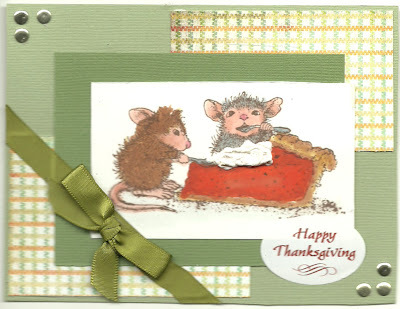 Thank you Sue from Dancing In The Puddles for being the first card posted in our challenge! Just finished a batch of holiday cards for OWH so this was perfect timing. Love this group, the dedication and all the wonderful card makers that share their love here! Oh my, you surprised me. Next time I'll read the fine print when posting, but it's kinda nice to see my little friends in such a special spot! Thank you. Wow. I love that design. It's so nice and whimsical. Tiny rats are cute. I hope to see a lot of inspiring and wonderful cards too.